Our butcher block pub table set is a great way to create a cozy and comfortable sitting area in any kitchen, bar area, or breakfast nook. 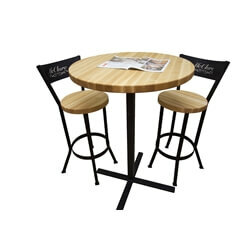 While our pub table and chairs are ideal for home use, they are also solid and durable enough for use in commercial settings. Both the table and the chairs feature a 1.5" thick butcher block top made by hand using the finest locally harvested hard maple. The base is made with a powder-coated metal that adds a rustic, yet contemporary look that naturally complements most decors. And remember, McClure Tables offers free shipping on every order over $70.00, so buy our pub table set today and have it shipped to your home or business for free.